Primary/External Index: For Indexes defined as Primary/External Indexes their list of values is fetched from external SQL based databases. Example: list of customers, vendors, etc. Secondary/Dependent Index: For Indexes defined as Secondary/Dependent Indexes their index values are filled/filtered up automatically as per rules based on a value selected in a previous index field. Example filling up of customer information automatically based on the customer name or ID selected in previous index field or filter out the list of vendors by region or type of products selected in a previous index field. 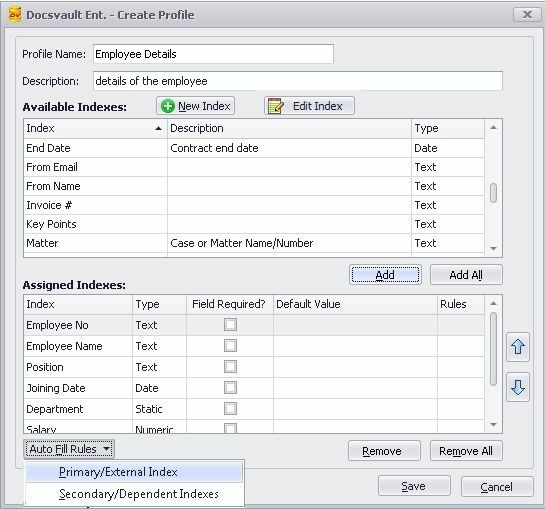 You define the auto filling rules for primary and secondary indexes when creating profiles in the Docsvault Server Manager dialog. 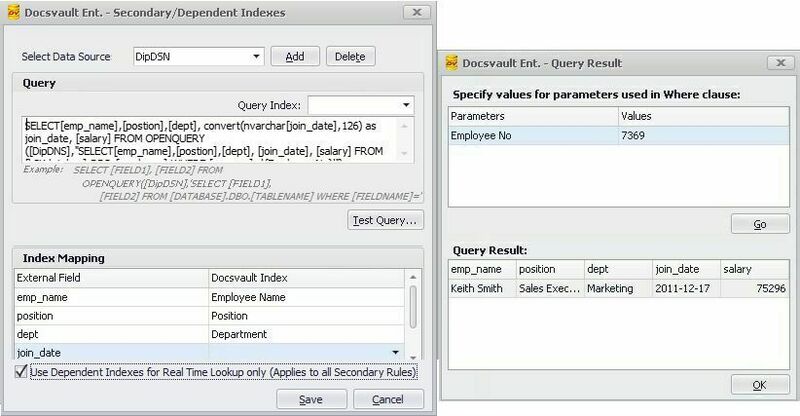 Once set properly, when profiling a document in Docsvault a user can select a value from the list that displays values dynamically retrieved from an external database and can also auto populate specified secondary/dependent index fields. You will first need to install proper ODBC drivers for the database that you are trying to link with. Almost all SQL based databases offer ODBC drivers to interact with them. A DSN (Data Source Name) contains all information that is needed for opening a data source like Server name or IP address, user name, password and special data source parameters, etc. You can create System DSN via ODBC Data Source Administrator (Data Sources (ODBC)) dialog found under Start > Control Panel > Administrative Tools in your OS. Since the setting of DSN are specific to your SQL data source, you should refer to your SQL data source documentation for further information on this. oSelect each index from 'Available Indexes' list and click on Add button. The selected index will get added to the 'Assigned Indexes' section. oSelect the index field and click Primary/External Index from 'Auto Fill Rules list box. oQuery: Enter a query in the format shown in the example below. This is syntax for MS SQL database to select primary index field. LOOKUPFIELD: Specify the lookup column name for easy identification. This is optional. FIELDNAME="VALUE": Specify a filter condition to return only the desired rows. The WHERE clause is optional. • Data Types: When you load data from the external table, the data types of the external table may not match the index's data type in Docsvault. In such cases you must perform conversions by using SQL operators in the SQL statement that is selecting from the external table. Any conversion errors that occur between the index data type in Docsvault and the external table cause the row with the error to be ignored. To avoid problems with conversion errors causing the operation to fail, the data type of the column in the external table should match the data type of the index in Docsvault. To query the k2Ydatabse database for the list of employees from the employee table enter this statement in the Query text box and then press Test Query button. Results will be displayed in the pop up window along with the look up column. oClick on Test Connection. On successful connection, query will be executed and a pop up window will display the results of the query for preview. 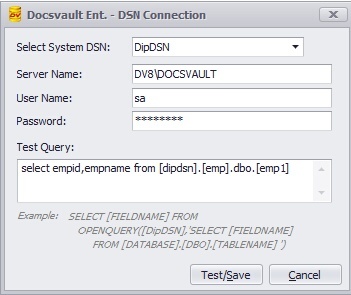 This indicates that the relation has been successfully established between Docsvault and the external database. Click on OK to verify the query syntax. filed is mapped with Docsvault index field "Employee No". The external field [emp_name] will act as a lookup field. oClick Save to save the configuration. •A profile can have multiple primary external indexes. •Please follow the proper SQL query syntax as shown in examples above. listed on the Docsvault Client side. If you wish to use the same index as a primary field in multiple profiles you can setup its external link in the 'Edit Index' dialog instead of this Profile dialog. oSelect Data Source: All System DSNs created on your machine are listed in this drop down menu. You can now choose the DSN to use for this connection. oSelect the index field and click Secondary/Dependent Index from 'Auto Fill Rules list box. 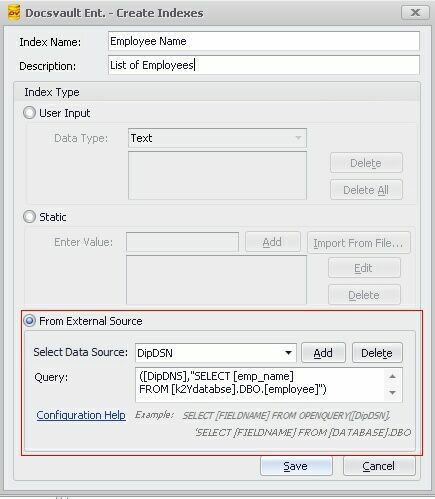 To query the k2Ydatabse database for the list of dependent fields of employees from the employee table, enter this statement in the Query text box and then press Test Query button. In the pop up window, you can test the result by entering the value for the primary field. On successful connection, query will be executed and result will be displayed in the Query Result section. 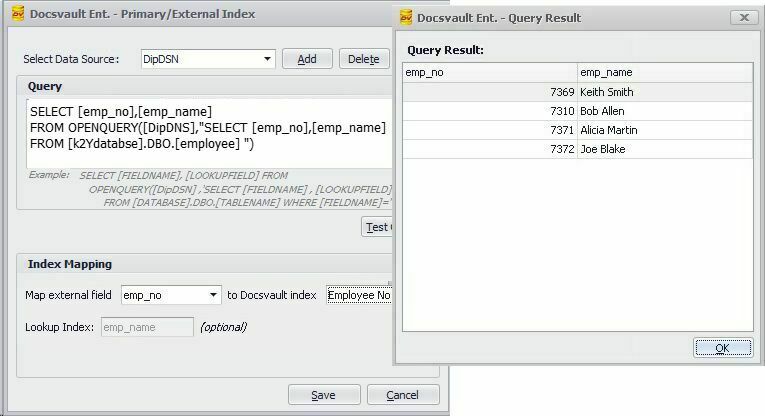 oIndex Mapping: This section allows you to map external database field with Docsvault index field as shown in the above screen shot. oReal Time Lookup: Enable 'Use Dependent Indexes for Real Time Lookup...' option to fetch index values for secondary or dependent indexes in real time when a document's profile is displayed.